It has now been just over a week since a lone gunman opened fire on moviegoers in Aurora, Colorado. The airwaves have been dominated by soul searching. Most of the pundits have concluded that the main cause of this calamity is the dark, strange behavior of the gunman. Talking about anything else, they say, is silly. The New York Times’ usually extremely wise columnist, David Brooks, explains that this is a problem of psychology, not sociology. At one level, this makes sense, of course, as the proximate cause. But really, it’s questionable analysis. Think about this: are there more lonely people in America compared with other countries? Are there, say, fewer depressed people in Asia and Europe? So why do they all have so much less gun violence than we do? The United States stands out from the rest of the world not because it has more nutcases – I think we can assume that those people are sprinkled throughout every society equally –but because it has more guns. Look at the map below. 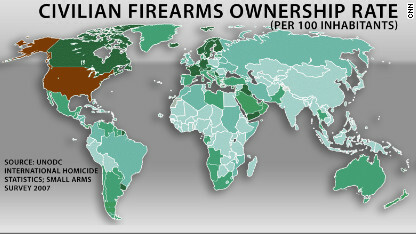 It shows the average number of firearms per 100 people. Most of the world is shaded light green – those are the countries where there are between zero and 10 guns per 100 citizens. In dark brown, you have the countries with more than 70 guns per 100 people. The U.S. is the only country in that category. In fact, the last global Small Arms Survey showed there are 88 guns for every 100 Americans. Yemen is second at 54. Serbia and Iraq are among the other countries in the top 10. We have 5 percent of the world's population and 50 percent of the guns. But the sheer number of guns isn’t an isolated statistic. The data shows we compare badly on fatalities, too. The U.S has three gun homicides per 100,000 people. That’s four times as many as Switzerland, ten times as many as India, 20 times as many as Australia and England. Whatever you think of gun rights and gun control, the numbers don’t flatter America. I saw an interesting graph in The Atlantic magazine recently. A spectrum shows the number of gun-related deaths by state. Now if you add one more piece of data – gun control restrictions – you see that the states with at least one firearm law (such as an assault weapons ban or trigger locks) tend to be the states with fewer gun-related deaths. Conclusion? Well, there are lots of factors involved, but there is at least a correlation between tighter laws and fewer gun-related deaths. I've shown you data comparing countries, and comparing states. Now consider the U.S. over time. Americans tend to think the U.S. is getting more violent. In a recent Gallup survey, 68 percent said there’s more crime in the U.S. than there was a year ago. Well, here’s what I found surprising: the U.S. is actually getting safer. In the decade since the year 2000, violent crime rates fell by 20 percent; aggravated assault by 22 percent; motor vehicle theft by 42 percent; murder – by all weapons – by 13 percent. But guns are the exception. Gun homicide rates haven’t improved at all. They were at roughly the same levels in 2009 as they were in 2000. Meanwhile, serious but non-fatal gun injuries caused during assault have actually increased in the last decade by 20 percent, as guns laws have gotten looser and getting automatic weapons has become easier. We are the world’s most heavily-armed civilian population. One out of every three Americans knows someone who has been shot. Everyone is entitled to his or her own opinion, but not to his or her own facts. Saying that this is all a matter of psychology is a recipe for doing nothing. We cannot change the tortured psychology of madmen like James Holmes. What we can do is change our gun laws. Should U.S. gun laws be tougher? What would you change? Topics: United States • What in the World? « Previous entryWill Kim Jong Un’s leadership be music to U.S. ears? You are comparing the US to Brazil and Mexico? Here in America we struggle with issues like guns that are not even a topic of discussion in other civilized countries. Or is it that we are a third world country with a fancy facade? I think that's what we are. And if it wasn't for our vast resources and 400 years of free black labor and the continues cheap labor that our hero immigrants give us we would compare to Afghanistan. I came to America 25 years ago from the cradle of civilization Greece and I finally figured it out how dangerous this Country is. It's time to head back to civilization so I can raise my child safely.